Here’s a link to ddclient.exe, a dynamic DNS client for Windows, to go with the dynamic DNS server that I’ve posted about as part of a 3-part series of posts (Part 1, Part 2). 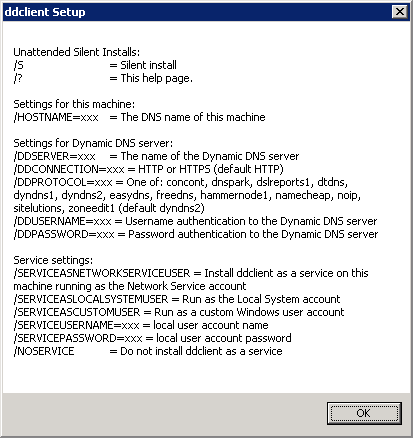 Click on the big green button with an arrow on it, download the installer, save it on a machine somewhere that you wish to refer to by a DNS name, run it, click the Next button a few times, enter the configuration values in the text fields shown below, click Next a few more times, and you should be right as rain. It’s essentially a PAR‘ed up version of a slightly modified ddclient, packaged as a Windows service with an NSIS wrapper around it so that you can install/uninstall it a bit easier. This should hopefully save you the trouble of installing and configuring perl / ddclient on each Windows machine that you wish to perform DNS updates for. Since the original ddclient looks like it might be GPL’ed, I’ll pop the sourcecode up here at some stage. In the meantime, if you want the sourcecode, let me know and I’ll email it to you. Here it is on github. Local System: Completely trusted account, moreso than the administrator account. There is nothing on a single box that this account can not do and it has the right to access the network as the machine. Network Service (recommended): Limited service account that is meant to run standard least-privileged services. This account is far more limited than Local System (or even Administrator) but still has the right to access the network as the machine. 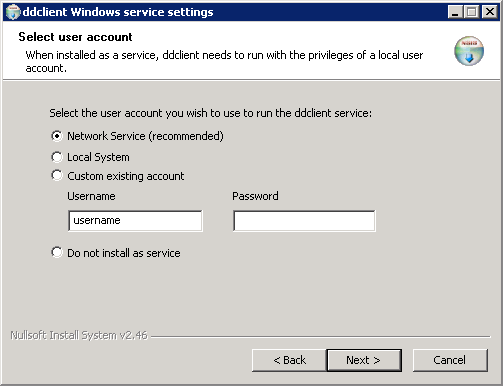 Custom account: If you like, you can choose an existing account, which can be a standard user account or one you have created if specifically to run the ddclient application. You probably just want to use the Network Service account. The installer (as of 1.1.0) now supports silent installation; that is, you can specify on the command line the details that are requested during install, and the client (and service) will be installed without displaying the graphical user interface. which would allow you to refer to the current machine as movingtarget.example.com, and access any publicly accessible ports on that machine from The Cloud, i.e. wherever you happen to be on the internet. Update 21/8/2013: Updated to version 1.0.1 of the installer/uninstaller (logs in application data, kills process during service removal), added screenshots. Update 25/8/2013: Updated to version 1.1.0 of the installer/uninstaller (silent install; software is now licensed under the ‘BSD Simplified’ license), updated screenshots/text. Update 26/6/2016: Updated to version 1.5.0 of the installer/installer (ddclient 3.8.3 changes including nsupdate protocol, cloudflare protocol, googledomains protocol and the duckdns protocol). Is there an equivalent for “use=if, if=eth0” on windows? Hi franz. Because the service is still running the original perl ddclient.pl under the hood, you should be able to use all available ddclient.conf parameters (including use and if). Is it possible to transmit the IP via SSL? If so – do I need something like OpenSSL additionally installed or does this client use libraries which Windows 7 already offers? I’m using SSL to update the IP. This is a great wrapper .. but it’s missing one small feature. In order to use the freedns.afraid.org, the installation has to include the Perl module Digest::SHA1. Is there any chance this could be packaged into the binary? Could you make an option for using SSL or not in the installation wizard? The SSL is required in my case. And sure, I can edit the config file, but that’s not very user friendly. Great idea–thanks for the work on this. I have updates to NameCheap working with some .conf modifications. However under XP with NTFS, the following warnings repeat in the log file, apparently on every update–concerned that the log may expand too much–is it trimmed occasionally? WARNING: file C:Program Filesddclientddclient.conf: file C:Program Filesddclientddclient.conf must be accessible only by its owner. WARNING: file C:Documents and SettingsNetworkServiceLocal SettingsApplication Dataddclient.cache: file C:Documents and SettingsNetworkServiceLocal SettingsApplication Dataddclient.cache must be accessible only by its owner (fixed). Well it looks like the ddclient under Windows wasn’t updating regularly after all, even though two instances of ddclient.exe were running in Task Manager. Also, I discovered that ddclient does not support one of my providers, DNS Made Easy. I wound up writing PowerShell scripts to do the updates. I’m not sure which protocol DNS Made Easy provide, but the full set of protocols implemented in the perl ddclient can now be selected in the NSIS installer in v1.2.0. The only thing to complain is memory usage (Win7 prof. and Win SBS 2011). I have two ddclient.exe in the taskmanager, one that describes himself as “A dynamic DNS client” with ~500 kB – which is fine. But there is another ddclient.exe in the taskmanager without description, an that one uses ~ 16 MB. That’s more than my downloadmanger (pyLoad), twice the memory usage of my torrentclient (µtorrent) – wich both include WebUIs – and 8 times the memory usage of my FTP-Server! Ihmo a bit heavy for an (relativley simple) DNS-Updater. I believe the current version of ddclient supports DNSEXIT (dnsexit.com). Any chance you could update to include this? Hi, would it be possible to include ipv6 support? The new ddclient Linux Version 3.8.2 has a new Variable “usev6”. So you are able to update ipv4 and ipv6. Would be nice. For anyone interested in using this client with Google Domains (domains.google.com), the stock installation won’t work, I *think* because it attempts to use the non-existent domains.google.com/nic/checkip.html for IP lookup. I have struggled my entire day to solve the problem and finally found your reply! Thanks from me as well! 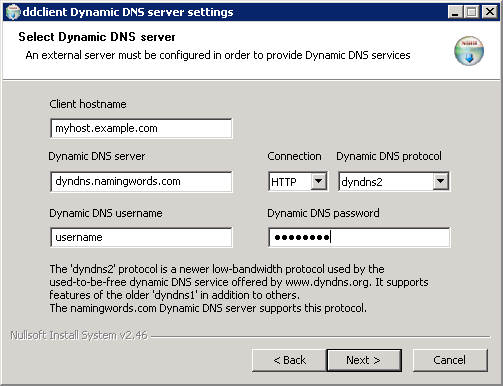 The ‘web’ value in the default configuration is wrong for dnsdynamic service. After fresh install this is: “www.dnsdynamic.org/nic/checkip.html”. This address responses “nohost” for me all time. Works great w/ Google domains if you choose a different server. myip.dnsdynamic.org works a treat. Thanks for making this! When I run the exe in the command line from “C:Program Files (x86)ddclient” I get the error “WARNING: file /etc/ddclient/ddclient.conf: Cannot open file ‘/etc/ddclient/ddclient.conf’. (No such file or directory)”. It’s as if the code still thinks it is on a linux machine. The errory is written twice to the console. Any idea why? "C:Program Files (x86)ddclientddclient.exe" -foreground -file "C:Program Files (x86)ddclientddclient.conf" -cache "C:UsersusernameAppDataLocalddclient.cache"
Replacing username above with your Windows username. (This is the command-line that’s used by the ‘Start ddclient console’ start menu shortcut. It looks like this very convenient tool was updated on May 20 2015 using version 3.8.2 of ddclient. Unfortunately this was just a few days before ddclient itself was updated to version 3.8.3 on May 28. One feature that is in 3.8.3 that would be nice to have is support for the “googledomains” protocol. Google Domains can be made to work using the dyndns2 protocol, but it would be nice to have Google’s own protocol supported too. With version 1.4.0 I have a problem. Whenever I restart the service another instance is started. So the previous process doesn’t get killed and just another one is started. This didn’t occur in the previous versions. Anyway thanks for the nice piece of software making my life more easy. I see the same question was asked here before. But… how to specify an interface in Windows? What is eth0 equivalent? Hi, if i start ddclient via task sheduler no logfile is to be found! Whereas the .cache file is generated correctly under the appdata of the current user running the task …. the logfile is not. When i run it as a service, it is generated. But not updated when run as a user again. So where is my logfile? When I try to edit the .conf I get an “Access is denied” message. Stop ddclient service, open ddclient.conf as adminstrator and you will able to edit and save your changes. Thanks the adaption looks great. Nevertheless I get an issue with OVH provider and the dyndns2 protocol. It looks like an update of the original DDCLIENT solved the problem. Do you plane to update this very usefull windows adaptation ? Will there ever be an update to allow multiple domain name updates with different providers? 1) Not sure if I am understanding all of the fields in the installer correctly. Should client host name be mysubdomain.domain.com and the server be “domains.google.com”? Or is the server the subdomain that I am trying to create the DDNS record for? 2) In trying several different config files I also tried to run the exe from command line and got the issue where it was looking for the config file as if it were in a unix environment. I tried running with the modifiers listed in a previous post but it just hangs there. No errors, no new prompt, it just sits there. No cache file was ever created in the directory referenced in the modifiers. So I’m not really sure what I’m doing wrong here. Running 1.5.0. I tried the installer config as dydns2 as well as googledomains for protocol. Same results. In the \Windows\Service Profiles\App Data\Local\ddclient.log file I do get an error that ends with “Invalid Value for keyword ‘ip’ = ”” referring to the cache file in the same directory. I have a domain that is a special ending. Like .tech .fun, .whatever… I keep getting errors ‘zone=’ is an invalid fully qualified host name. I’m assuming that this problem is because of the weird domain ending. This recently has stopped working with nsupdate.info when SSL is enabled, on several computers (all that I’ve looked at so far). I believe it is something they changed on their end. If I set to non-ssl it works normally. It looks like it doesn’t like the TLS version they now require, perhaps. Thanks. Can DD client handle more than 1 entry? I want to move my domains from noip.com which I’ve used for years, to google domains. However I have a problem moving these domains to google in that I found that my ZyWall 110 has a maximum of 10 entries that can be configured for DDNS. I’ve configured 10 google domains successfully using their DDNS service (albeit took a while as im not technical) however have hit a roadblock in that I’ve found the 10 entry limit (Zyxel support says this cant be changed). I tried googling to find a workaround solution most suggested scripts etc beyond my technical skills but found no “clients” that can update DDNS until I found your DDClient solution. I went to install the app but it appears that it will only update for a single entry? Can you run multiple domains on google with this client? Removing the crapware from your smartphone.